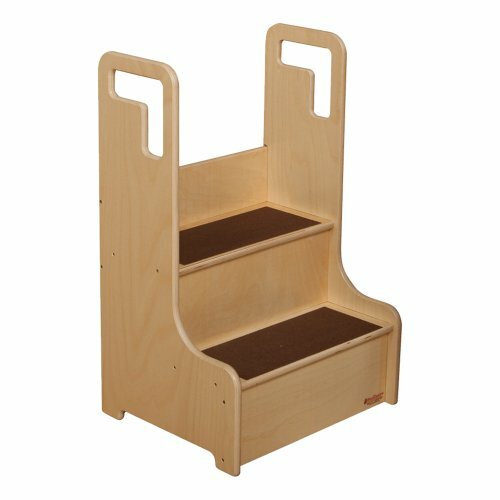 Sprogs' Wooden step stool offers a safe, sturdy option to help little ones wash their hands or REACH a changing table. This stool is made entirely of Baltic birch plywood and features a durable, water-resistant UV finish. Slip-Resistant strips on each step help prevent falls, and smooth, rounded edges make it a safe choice for your preschool or daycare. The handles at the top allow you to move the stool easily around your classroom. Assembly required. Constructed from Baltic Birch plywood with a durable, water-resistant UV finish. Slip-resistant strips on each step help prevent falls. Grap handles and slip-resistant strips on each step make it safe for children. Lower step measures 6 9/16" H ; upper step measures 13 1/4" H.